Chances are, the everyday handyman has never considered adding a hammer drill to their collection. However, these powerful drills are able to easily outperform a normal drill when dealing with hard materials, and quickly earn their keep. Some can even double as a regular drill. Read on to learn more about hammer drills and to find the best hammer drill for your needs. When compiling this list, we took three factors into account. First, the drill had to be powerful enough to get the job done. Second, it needs a decent battery life. And third, it needs a balance of quality and price to make it useful in both home and construction settings. Arguably the best cordless hammer drill on the market, this drill is far more compact than you would expect, measuring a mere 8.4 inches long. The brushless motor provides 820 Units Watts Out for 2.8 times faster application speeds, giving you 2,250 RPM and 0-38,250 BPM. At only 4.7 pounds, it’s one of the lightest models out there. Its brushless motor and high performance transmission can run up to 57 percent longer than brushed models, while providing up to 82 percent more power. Additional features include comfortable handle grips, 3-mode LED with a spotlight mode, durable nitro-carburized metal ratcheting chucks, and sealed switches to help prevent contamination from dust or moisture. As you would expect from a DeWalt tool, this hammer drill can cut through even old concrete like butter. Extremely tough jobs can shorten the battery’s runtime or overheat the drill bits, but a little care means you can complete these jobs before having to replace either. In fact, this tool is so powerful, it can easily get away at full speed if you aren’t using both handles! The clutch on this model has proven a pain for some individuals, as it tends to simply halt the motor when tightened too far, as opposed to making a click when it reaches optimal tightness. Another issue for some is that this tool doesn’t come with a battery, so make sure you purchase one if you have other 20V MAX tools in your arsenal. This compact 1/2-inch brushless driver-drill provides an impressive 1,090 pounds of max torque and variable two-speed transmission capable of 0-550 or 0-2,100 RPM. The unit is powered by an 18V LXT Lithium Ion battery for long charge life, and features a three-stage LED gauge that allows you to monitor the battery’s charge level. 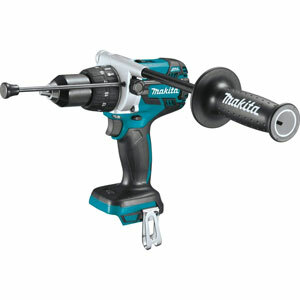 A true example of Makita quality, this drill packs a lot of power. Users love the way the drill responds to trigger pressure, allowing you to get the exact speed you want. Both pros and weekend warriors will appreciate the power, but be prepared as it can rip through concrete with such force that you can easily lose control on the higher setting. While an excellent drill overall, several consumers have had problems with the chuck coming loose while the drill’s in reverse mode or breaking completely. Customer service is quick to address this issue when it arises, however. 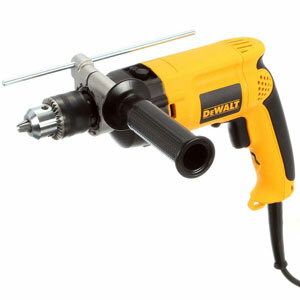 It should also be noted that this drill is only sold as the bare tool, so you will need to purchase a battery if you don’t already own any 18V LXT batteries. Drill bits are also sold separately. 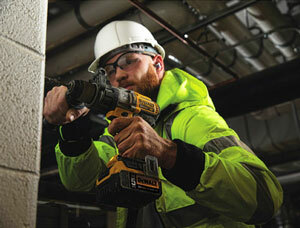 This drill driver uses a Powerstate brushless motor capable of 1,200 in-lbs of peak torque at as much as 2,000 RPM. It uses Red Lithium batteries, which hold a longer charge than standard lithium ion batteries. As with many of the popular Milwaukee M18 Fuel line of tools, the drill has Redlink Plus, an intelligent monitoring system which prevents damage due to overheating or power overloads. 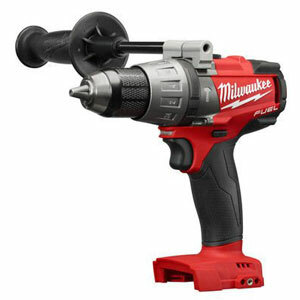 As can be expected from Milwaukee, this is a powerful, lightweight tool that quickly finds its way to the forefront of most owners’ tool sets. Not only does it do an excellent job on concrete, but it also does an excellent job as a regular drill in a pinch for those with experience using hammer drills. The screw drive selector and variable chuck give this tool a range of use far greater than much of the competition. The chuck on this drill has suffered a variety of issues for a handful of consumers. In some cases, it lets go of the bit, in others the bit gets stuck. These problems don’t happen for everyone, so they may be due to poor QC or bad batches. Also, a few buyers have received refurbished tools instead of new ones so make sure to purchase from a reputable online seller. 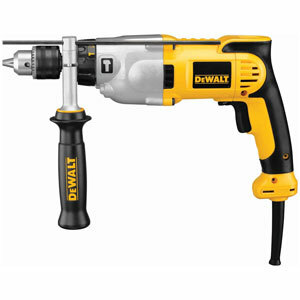 Trust DeWalt to deliver the best corded hammer drill on our list. This 1/2-inch 10 Amp hammer drill kit features a two-speed range to provide speed or torque as needed, soft grip handle, two finger trigger, and can be used in either hammer drill or standard drill mode. The patented DeWalt motor is designed to provide 50 percent more power while also having increased overload protection. A metal gear housing increased the drill’s overall durability and the side grip can be turned a full 360 degrees for superior handling. This is an excellent drill for masonry projects, and users report short work times for multiple stone-like surfaces. 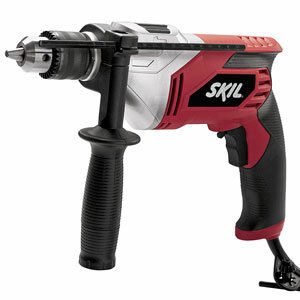 The drill mode won’t work well on very soft surfaces (such as drywall), but does a great job with most types of wood. Overall, this is a drill you can expect to be using for years to come. While no drill is perfect (and the DWD520K isn’t an exception), the biggest issue is noise. You may want to wear ear protection using this drill. Additionally, it can overheat after prolonged use on tougher surfaces, so be sure to cool off the bits and allow the drill itself to cool if it starts getting too hot. 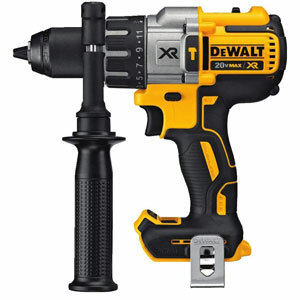 Another corded, dual-mode hammer drill from DeWalt, the DW511 sports a lighter 7.8 Amp motor designed for extended, high performance use. The 360 degree side handle and depth control rod help ensure superior control and depth accuracy, while variable speed means precision work every time. For a smaller drill, the DW511 has proven quite useful for a number of tasks and materials and its excellent quality to price ratio has made it a popular seller over the years. It’s excellent for soft masonry, and a few users have reported using it for granite. You may need to look up a video on how to use the chuck key holder, but this feature has been a welcome one for the majority of consumers. Some owners of this model have reported issues with the chuck holding onto bits. In a few other cases, there have been reports of it overheating quickly. Many of these complaints may be related to older versions of this model, which has undergone a few design updates since its initial release. This compact, inexpensive hammer drill isn’t lacking in power, providing a 7 Amp motor with precise variable speed trigger and lock-on option. The side assist handle adds extra support and control for those tougher jobs. A 1/2-inch keyed chuck allows you to use larger bits when doing woodworking projects, making this hammer drill even more versatile. While not suitable for industrial use, this baby has proven itself on everything from wood to metal. It absolutely shines when working with even old concrete. Users have also noted that the construction is far more durable than it looks, with numerous key parts made of metal instead of plastic which is rare at this price point. There have been some issues with overheating on this model. In a few cases, users have reported it starting to smoke and even having the motor burn out without any warning. Fortunately, these issues aren’t common, and seem to be related to this drill’s lack of a dual mode, which can make it harder to balance speed and torque. Hammer drills are a more specialized tool, so you won’t find them in the average tool chest. For this reason, there’s a lot of confusion over what they are, what they do, and what makes them different for similar tools. A hammer drill is a high impact tool which is designed to cut through tougher materials, such as metal and concrete. As the bit turns, two ridged discs slide against each other. The ridges force the two discs apart at each peak, which in turn forces the chuck forward and back. This motion produces a hammering effect that pulverizes material, allowing the bit to go deeper with less effort. A clutch prevents this hammering action when there is no pressure on the chuck, preventing unnecessary wear and tear. Hammer drills are designed to work on surfaces much harder than wood. When equipped with a masonry bit, it can be used for concrete, brick, stone, or similar materials. A diamond-tipped bit can also allow it to dig into metal. This versatility makes it useful for a wide range of jobs, although it’s most commonly used as a concrete drill. While commonly referred to as the same tool, hammer drills and impact drills are actually very different machines with their own functions. This is most easily spotted by the short-nosed design of an impact drill and its hexagonal socket. Impact drills function much like a regular drill until enough torque has been generated. This causes the impacting gears to kick in, adding additional power. They’re most often used for adding bolts and other fasteners, whereas hammer drills excel at punching holes into concrete and other hard surfaces. Rotary hammers use air pressure created by a piston and crankshaft to deliver its hammering motion. As a result, they can deliver higher impact and tend to be more durable. An added bonus is that they have three settings: drill, hammer drill, and hammer mode. Rotary hammers are more expensive than hammer drills and are designed for much heavier tasks. This makes them a good choice for major construction sites but seriously overpowered for regular concrete work. Is a Brushless Drill Worth the Extra Money?